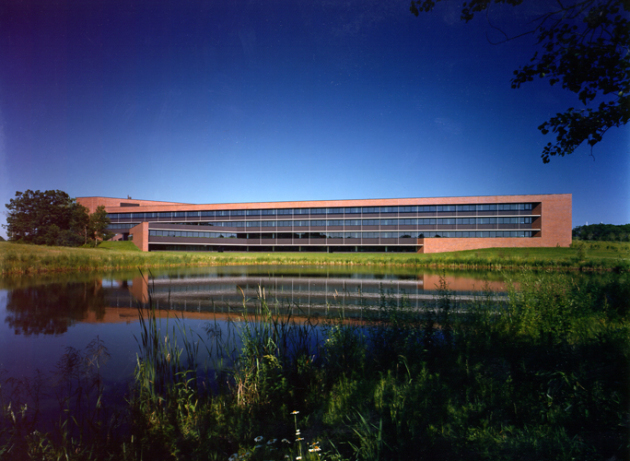 Land O'Lakes corporate headquarters in Arden Hills, Mn has won the 25-year award from the American Institute of Architects Minnesota. The award goes to buildings between 25 and 50 years old whose design has "stood the test of time." Designed by the Architectural Alliance, the Land O' Lakes complex was produced by a team including Dennis LaFrance, AIA; John Lackens, FAIA; Ron May, Lynda Lujan, David Solomon, Gretchen Wesenberg, Charles Sandvig, Paul Ashley, Rex Crook, Craig Johnson, and Bob Stolz. Their Land O'Lakes building was cited for its environmental, functional and economical qualities. Located on a 50-acre site near a major freeway, the building is in a wooded area surrounded by natural landscaping including marshes that were expanded to control stormwater runoff. The structure features an entrance and public areas defined by dramatic rectilinear and trapezoidal volumes. Its three-story entrance lobby has sloped glass and incorporates interior plantings in a green-house style setting. Earth sheltering and extra insulation minimize heat loss. Circulating outdoor air helps with cooling, and computer waste-heat is recirculated. A unique electrical distribution system reduced lighting loads to 60 percent of what was typical for the era when the building was designed. Land O'Lakes, Inc. is a diversified Fortune 500 agribusiness that began in 1921as a dairy cooperative founded by 350 Minnesota farmers.